So excited to finally share this branding project (one of my favs from 2016), just in time for the new year! Tiffany is a bold and fearless travel and lifestyle blogger, who's adventures over at Tiffany Eat World are guaranteed to make anyone yearn to break free of their everyday routine and explore the world. Working with Tiffany was such a breath of fresh air. She isn't afraid of vibrant brand colours (as you can tell by the mood board below) and she's passionate about producing non-fluffy travel content. Yes, yes, and YES please! We narrowed in Tiffany's target audience to millennial working women who balance meaningful international experiences with their desire to move up in the world. They live boldly and with fearless abandon. Her readers also value experiences when they travel over social validation (I LOVE this). Tiffany's travel photos are bright and colourful, so having a mood board that was anything less than that just wouldn't do. She also loves graphic elements and bold patterns. Her desired colour scheme balanced a modern black and white with pops of colour that scream life and adventure. Once I got the go ahead on the mood board I moved onto creating some logo concepts that suited her desired aesthetic. As with all logo design projects, I began with sketching out rough concepts with no rules or restrictions just to see where it takes me. Then, I digitized my favourite concepts and present them without colour to Tiffany. She actually totally fell in love with one right off the bat, which made the revision process super straightforward. 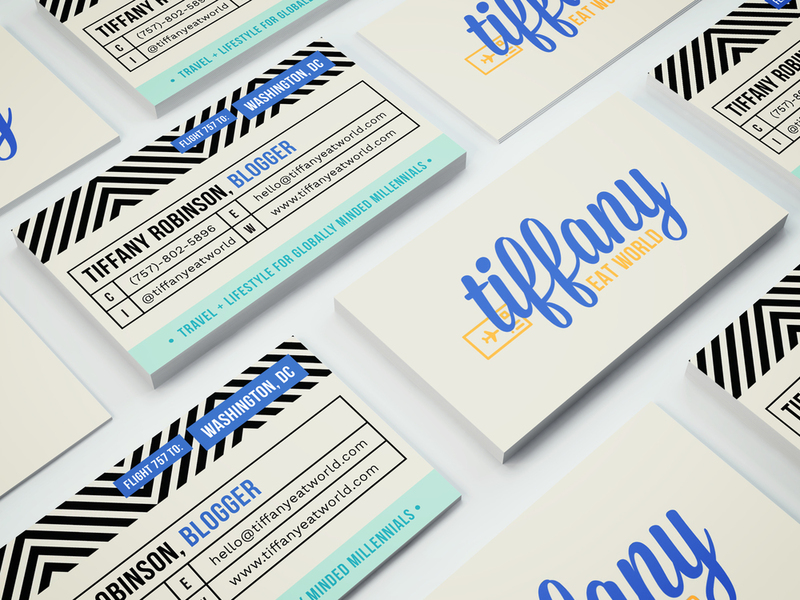 I took the travel blogger concept to a whole new level with Tiffany's business cards! Love how these turned out with her bold palette and patterns! I'm also obsessed with the seamless pattern I created for Tiffany. Patterns are definitely no walk in the part to develop but I love exploring this new medium for my clients. Tiffany was such a laid-back, open-minded client and I loved that she always gave me super specific feedback at every step of the process. Can't wait to see where this fierce lady travels to next! If you aren't already, be sure to head over to Instagram to follow Tiffany! Looking for a brand that fits your dream audience and kicks it up a notch? Let's chat. © Odds & Ends Creative | Site and materials designed by Odds & Ends Creative.